Ethiopian security forces killed more than 400 people in their bid to quell protests that wracked the Horn of Africa country's vast Oromiya province since November, Human Rights Watch said on Thursday. Plans to allocate farmland in Ethiopia's largest region surrounding the capital for development sparked fierce demonstrations in November and spread for months, in the country's worst unrest in over a decade. Ethiopia has long been one of the world's poorest nations but has taken impressive strides to industrialise its agrarian economy in recent years. However, reallocating land is a thorny issue in the country of 90 million people whose majority are subsistence farmers. Authorities scrapped the land scheme in January, but protests and arrests continued. The government rejected the findings of the report, saying there was no evidence to back up the death toll it cited. In the 61-page report, U.S.-based Human Rights Watch (HRW) said Addis Ababa deployed its military and used live ammunition for crowd control repeatedly as the protests spread, "often with little and no warning". The watchdog said tens of thousands have also been arrested during the crackdown, whose scale was described as unprecedented by witnesses in the report titled "Such a Brutal Crackdown: Killings and Arrests in Response to Ethiopia's Oromo Protests". "The government should immediately free those wrongfully detained, support a credible, independent investigation, and hold security force members accountable for abuses," said Leslie Lefkow, the watchdog's deputy Africa director. Government spokesman Getachew Reda said HRW had "plucked its numbers from thin air", adding a domestic rights watchdog had carried out its own report. That body tallied 173 deaths. "Even one person is one person too many. The government regrets the fact that people are killed because these were avoidable deaths," he said at a press conference on Tuesday. "But we believe in many parts of Oromiya where the protests were quite common, security forces conducted themselves in a very professional and responsible manner." The protests were a rare expression of dissent in a country where police are feared as heavy-handed and the government is seen as repressive. Ethiopia's Prime Minister Hailemariam Desalegn has said his administration would address grievances in the Oromiya region and has blamed rebel groups for stoking violence. Israel made some mistakes during the absorption process of immigrants from Ethiopia over the years, and must strive to do better, President Reuven Rivlin said on Sunday at a memorial held by the Ethiopian-Israeli community for those who died while trying to reach the Jewish state. "Israeli society is obligated to continue to readdress the failures, and ensure that aliyah [immigration] to Israel becomes more and more attractive and fitting," Rivlin said at the ceremony Sunday morning at Mount Herzl cemetery in Jerusalem. Israel made some mistakes during the absorption process of immigrants from Ethiopia over the years, and must strive to do better, President Reuven Rivlin said on Sunday at a memorial held by theEthiopian-Israeli community for those who died while trying to reach the Jewish state. Ethiopians who made their way to Israel paid a dear price, Rivlin said, "financially, physically, spiritually, and in the difficult acclimation." Between 1979 and 1990 Israel organized several transports of Ethiopian Jews to Israel via Sudan. Hundreds or, by some estimates, thousands of people died on the trip from Ethiopia to the Sudanese camps from where they left to Israel. Some 1,500 names of those who died while en route are engraved on a monument at the site. Some 18,000 who survived the journey. Many in the community say that upon reaching Israel, they found a country that did not do enough to integrate them into society. “There needs to be a great effort in the everyday way we relate to the immigrants from Ethiopia, and also in spreading the community’s story of devotion, the story of those who perished, and those who were held captive, so that it is an integral part of the Israeli story,” Rivlin said. Netanyahu, like Rivlin, also acknowledged the “big challenges that come with a return home” and with the integration process into Israeli society. The prime minister said that above all, his number one priority was to see the eradication of racism and discrimination many in the community feel. “It’s an infuriating phenomenon in our society, it’s intolerable and we are fighting it full-force,” Netanyahu said. And while acknowledging the difficulties, the prime minister also touted the success stories from among the Ethiopian community, touching on the pride he feels when he sees young members of the community wearing the IDF uniform. Netanyahu also addressed a burning issue in the Ethiopian community, that of relatives left behind who have yet to make aliyah amid government obstacles throughout the years. Some 1,300 Ethiopians who claim Jewish descent, known as Falashmura, will begin arriving in Israel this month, with 9,000 to come over the next five years, under a new Israeli government agreement reached in April. The agreement came after a public campaign launched by the Ethiopian community in Israel and volunteer organizations. The cost is estimated at $1 billion. Falashmura are Ethiopians who claim links to descendants of Jews who converted to Christianity generations ago, but now seek to return to Judaism and immigrate to Israel. Their permanent entry into Israel will be dependent on completing the conversion process. Over five hundred Ethiopians of different ethnic groups gathered in Nairobi to discuss the human rights violations in their country. The discussions coincided with 25th anniversary of the fall of Mengistu regime. The Ethiopians who attended the three-hour debate included members of the Oromo people who are opposed to the government's plan to expand the capital Addis Ababa. They say it amounts to land grabbing. Late last year, violence and chaos gripped Ethiopia as thousands of demonstrators took to the streets in protest against the expansion plan. Human Rights Watch said more than a hundred people were killed in a bloody crackdown by heavily armed security forces. The demonstrations spread to several towns since November. On Thursday, participants described the suffering of marginalized groups in Ethiopia and accused the government of persistently abusing their human rights. According to Ebba Abba Murti, the public relations officer for the Oromo refugee community in Kenya, the debate aimed at drawing the international community's attention to what is happening in Ethiopia. "This is about inhumane treatment of the Oromos from their ancestral land. Prisons in Ethiopia are full of Oromos," Murti said. "We want the international community to act on it and to put the Ethiopian government to task and to condemn the injustices our people face," he added. 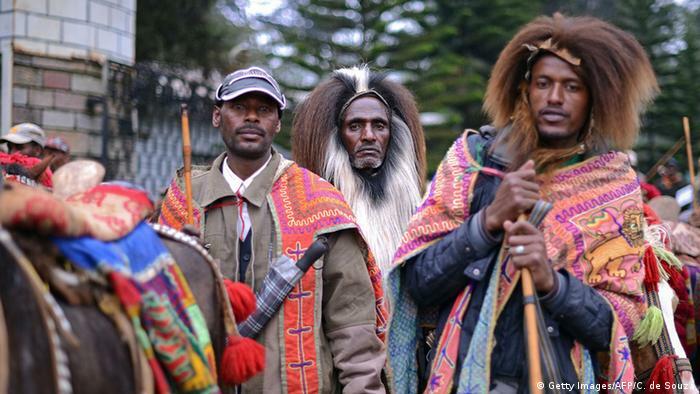 The Oromos, a population of over 50 million people, claim to be the largest tribe in East Africa. Will the government hear the Oromos' outcry? After months of protests with many demonstrators losing their lives, the highly controversial so-called Addis Ababa master plan has been shelved for the time being. According to DW's head of Amharic service, Ludger Schadomsky, the shelving of Addis Ababa expansion calmed down the protests, but members of the Oromo ethnic group feel that they were marginalized despite constituting the largest ethnic group in the country. "This conflict is not likely to go away anytime soon. 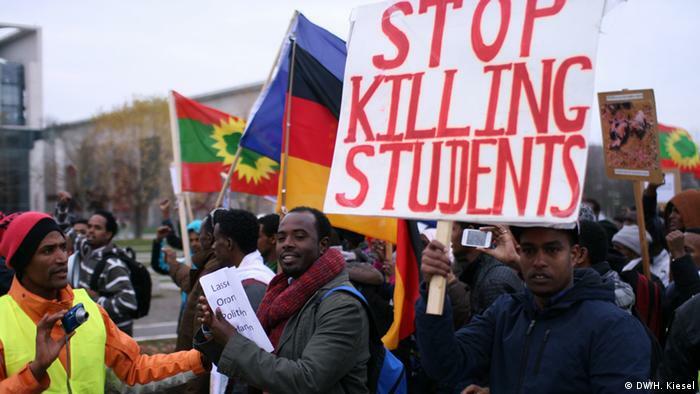 Particularly students in Oromia universities continue to be very restive," Schadomsky said. The debate coincided with the 25th anniversary of the fall of the brutal Mengistu regime, also known as the Derg, and the coming to power of the ruling Ethiopian Peoples' Revolutionary Democratic Front (EPRDF) in 1991. Mengistu Haile Mariam is a former Ethiopian military ruler who lives in exile in Zimbabwe. He was the most prominent officer of the Derg, the Communist military junta that governed Ethiopia from 1974 to 1987. From 1987 to 1991, Mengistu was the President of the People's Democratic Republic of Ethiopia. According to Schadomsky, also an expert on Ethiopia, the downfall of the Mengistu regime was greeted with great joy at that time. 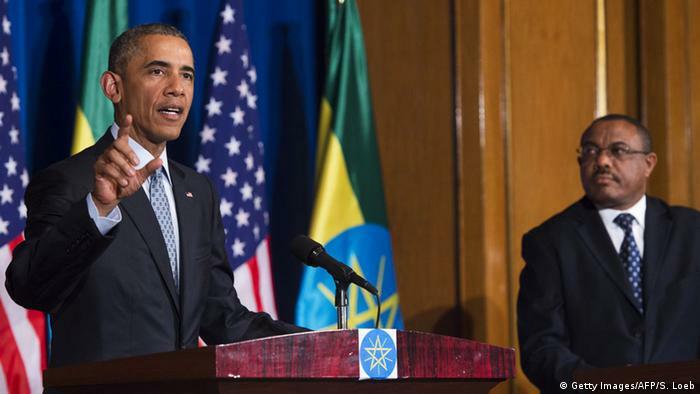 25 years down the line, Ethiopians enjoy more civil liberties. Nevertheless, young people feel betrayed by the ruling EPRDF government as it continues to narrow the political space in the country and crackdown on even moderate dissent. "With a huge number of unemployed youths, Ethiopia today feels like a pressure cooker that is about to blow its lid," Schadomsky said. Amnesty International's director for East Africa, Muthoni Wanyeki, said there's a long way to go in terms of respect for human rights in Ethiopia. And his colleague, Mariam Idriss added that "human rights violations are not supposed to be looked down upon," Idriss said. "It is upon the role of every state to take into consideration the rights and privileges that people are entitled to." he added. Oromia is Ethiopia's largest region, and many there believe the government did not want to redevelop services and roads, but that it was engaged in a land grab. James Shimanyula in Nairobi contributed to this report.